Demonstrations against the Shah of Iran were in full swing in the United States and Europe as early as 1977 and continued until the success of the Islamic Revolution of Iran in January of 1979. This victory led to the fall of the Pahlavi regime. Consequently, many regime supporters including members of SAVAK, the shah’s personal secret police force, began to hold demonstrations demanding the United States overthrow the elected government and reinstall the shah – or his son – as monarch. The hope was that the United States would orchestrate a coup similar to the one they had helped manufacture in 1953 against Iranian Prime Minister, Monhammad Mosaddegh. At the same time, pro-revolution demonstrations continued, often in conflict with the pro-shah supporters. 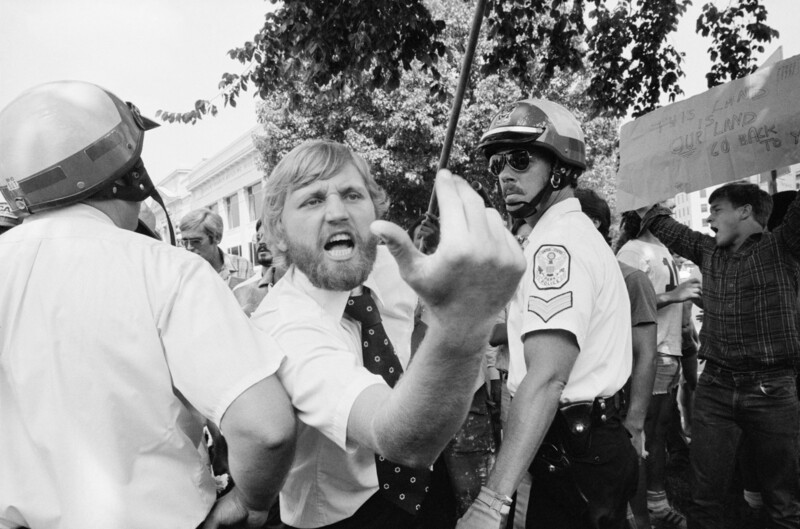 One demonstration turned particularly chaotic in the summer of 1980. Safiyyah Abdullah was there and gives her account of the events that led up to a spontaneous act of solidarity by a group of indigenous American activists.